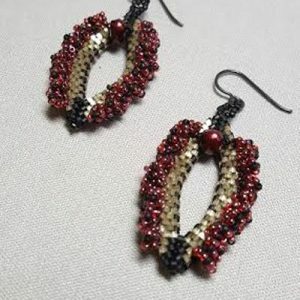 These earrings are Swarovski “fur”. They are nothing but crystals and sterling. 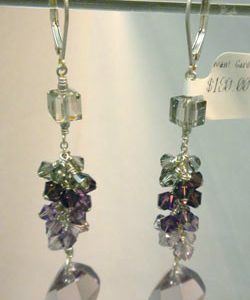 Our staff create lovely and slow color gradations from the larger bottom piece and slowly move towards the cube on top. 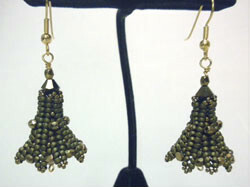 Lever back ear wires make are a great finishing touch to these amazing earrings. Add 15% for custom orders which must be placed over the phone or in person. 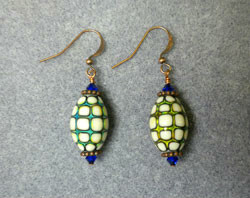 Polymer mirage bead will change colors with your mood. 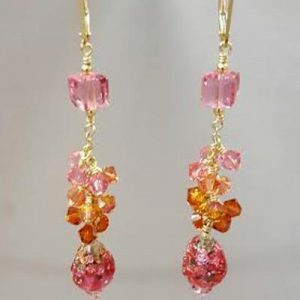 These beads are topped with Swarovski crystals and copper with a copper ear wire. 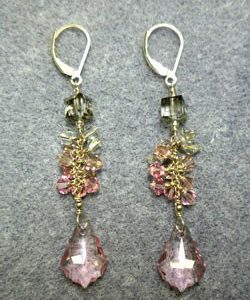 A baroque style Swarovski pendant dangles underneath a cascade of “crystal fuzz”. The pink color is graded to the pink/grey on the top. 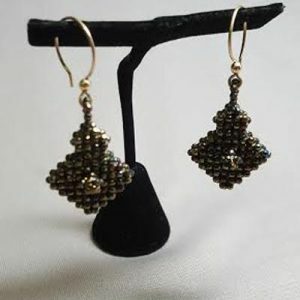 These earrings have lovely movement and are a joy to wear and to see others wearing them. This color way has sold. In stock is a pair that goes from purple to green. We are happy to design a custom set of colors for you. Add 15% for custom orders which must be placed over the phone or in person.